All three of the most common types of skin cancer (Squamous Cell Carcinoma, Basal Cell Carcinoma, and Malignant Melanoma) are increasing in incidence. These cancers are typically treated by surgical removal. Early detection for all of these types of skin cancers is associated with the highest cure rate and best cosmetic outcome. Derm.ca is a certified Non-Hospital Surgical Facility (NHSF) in Calgary, Alberta operated by Dermatologist Dr Ken Alanen. We are recognized subspecialty experts for the diagnosis, treatment and prevention of skin cancer. Mohs’ Micrographic Surgery is performed for patients who have biopsy-proven skin cancer in anatomically sensitive areas (e.g. face, hands etc). Patients with a history of skin cancer or who have significant skin cancer risk factors are offered routine skin surveillance. 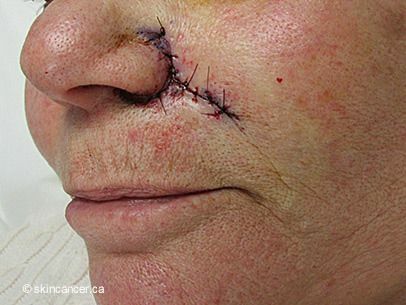 Derm.ca offers an Urgent Skin Cancer Service; patients can usually be seen within 48-72 hours. If you are concerned about skin cancer and want to book an appointment, please contact us. Dr. Alanen offers Complete Skin Review, a comprehensive overview of your skin. This includes examination of any suspicious lesions with a polarized light dermatoscope. If it is deemed ideal based on significant sun damaged noted during the CSR, three dimensional photography with the cutting edge Vectra system will be recommended. Any concerning lesions during the CSR are biopsied. Patients with numerous suspicious moles are offered mole mapping. Squamous cell carcinoma (SCC) of the skin is the second most common cancer of humans, almost as common as basal cell carcinoma (BCC). It occurs most often on sun exposed areas – especially the face, neck, forearms arms and hands. 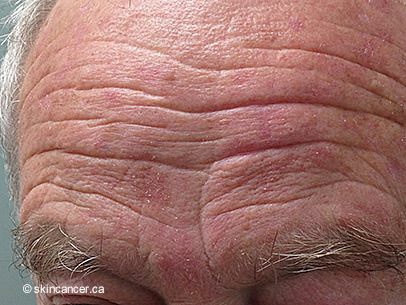 It is common on the scalp in bald men with a significant sun exposure history. 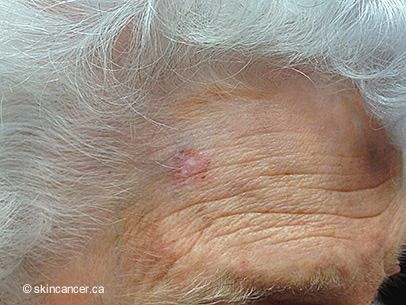 Squamous cell carcinoma of the skin has a low but genuine risk of metastasis (spread to other organs) and fatality if it is not treated. The most important risk factor for developing basal cell carcinoma is ultraviolet light exposure for many years. As for BCC, low grade repeated sun exposure is implicated in its development, although sunburns and suntans do contribute to SCC risk. The risk of SCC is increased in patients who have used tanning beds and in patients with a history of phototherapy for psoriasis. SCC is also associated with exposure to human papillomavirus (HPV) and is common in organ transplant recipients who are taking immunosuppressive medications. It classically starts from actinic keratosis. 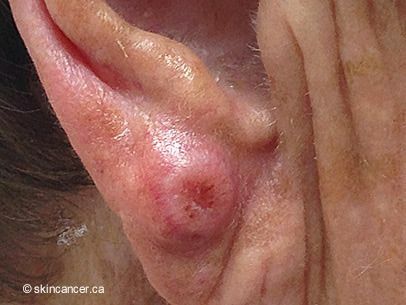 SCC most often looks like a thick crusty wart but may also present as a non-healing ulceration. 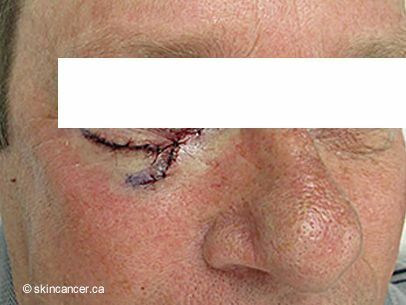 Squamous cell carcinoma is best treated by surgical removal. Surgical removal classically is associated with the best cosmetic outcome and cure is confirmed by laboratory analysis of the excised tissue. Many other methods exist. 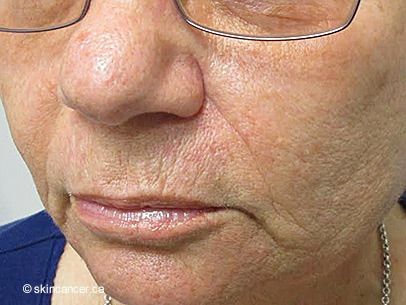 Laser therapy, cryotherapy and topical creams are not reliable methods for treating SCC. For many patients with SCCs, the method of choice for removal is called Mohs’ micrographic surgery (MMS). This is a combined surgery and pathology procedure. 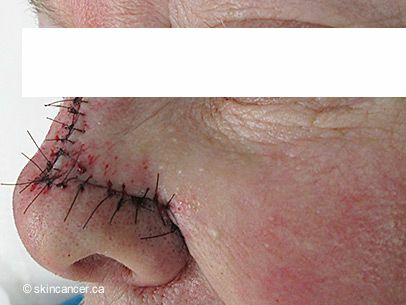 With typical skin cancer surgery, the cancer is removed and the defect is immediately stitched. However, there is no immediate corroboration that the cancer has been removed (until tissue analysis is completed a week or so later by the outside pathology laboratory). 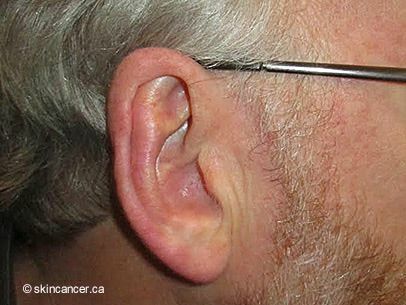 Mohs’ micrographic surgery is unique because the excised tissue is examined under the microscope while the patient is still in the clinic and only when there is assurance that all of the cancer has been removed is the stitched closed. The microscopic examination part of the Mohs’ procedure is often regarded in the dermatology community as the most difficult part of the procedure. However, Dr. Alanen is a recognized subspecialist in microscopic diagnosis of skin cancer – he is a subspecialty trained skin pathologist (dermatopathologist) with exam certification (Dermatopathology Subspecialty) examination jointly administered by the American Board of Dermatology and American Board of Pathology. 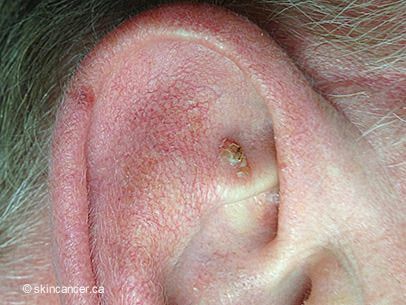 Basal cell carcinoma (BCC) is the most common cancer of humans. It occurs most often on sun exposed areas – especially the face, neck, forearms arms and hands. The most important risk factor for developing basal cell carcinoma is ultraviolet light exposure for many years. Low grade repeated sun exposure (for example, a short afternoon walk, driving in a car without sunscreen etc). The risk of BCC is increased in patients who have used tanning beds and in patients with a history of phototherapy for psoriasis. 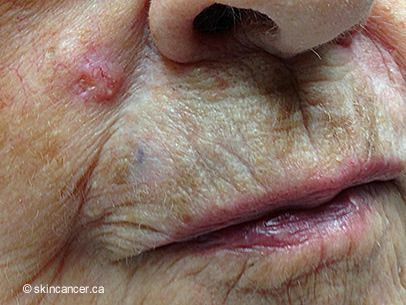 BCC most often looks like a “non-healing sore” or persistent pimple (the nodular subtype of basal cell carcinoma). However, it may also resemble a “scar” (the desmoplastic subtype of basal cell carcinoma). 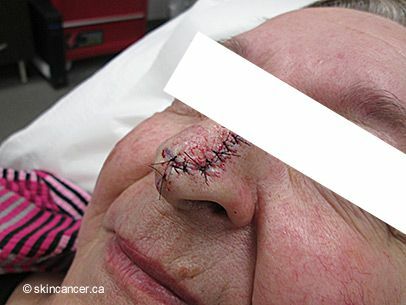 Basal cell carcinoma is best treated by surgical removal. Surgical removal classically is associated with the best cosmetic outcome and cure is confirmed by laboratory analysis of the excised tissue. Many other methods exist (e.g. cryotherapy, laser, radiation, topical creams) but these are less effective and, importantly, there is no tissue analysis (nothing “sent for biopsy”) to confirmation that the cancer has been definitively treated. For many BCCs, the method of choice for removal is called Mohs’ micrographic surgery (MMS). This is a combined surgery and pathology procedure. 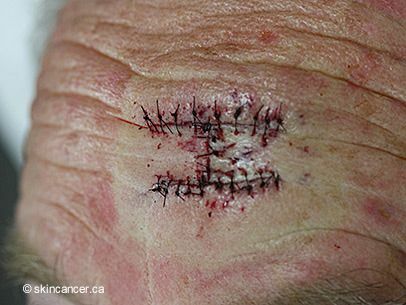 With typical skin cancer surgery, the cancer is removed and the defect is immediately stitched. However, there is no immediate corroboration that the cancer has been removed (until tissue analysis is completed a week or so later by the outside pathology laboratory). Mohs’ micrographic surgery is unique because the excised tissue is examined under the microscope while the patient is still in the clinic and only when there is assurance that all of the cancer has been removed is the stitched closed. The microscopic examination part of the Mohs’ procedure is often regarded in the dermatology community as the most difficult part of the procedure. However, Dr. Alanen is a recognized subspecialist in microscopic diagnosis of skin cancer – he is a subspecialty trained skin pathologist (dermatopathologist) with exam certification (Dermatopathology Subspecialty) examination jointly administered by the American Board of Dermatology and American Board of Pathology. 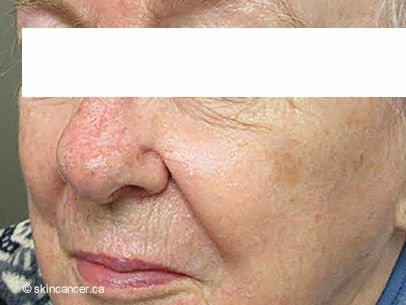 Malignant melanoma is the most serious type of the common skin cancers. Melanoma may start from a pre-existing mole (about two thirds of melanomas originate from moles ) or arise on normal skin (about one third of melanomas start this way). Not all melanomas are related to sun exposure or tanning beds although sunburns, suntans and tanning bed use greatly increase the risk of melanoma. The risk factors for melanoma include: fair skin, red / light hair hair, numerous freckles, numerous moles, a history of sunburns (especially in youth), a personal or family history of numerous “dysplastic’ (atypical) moles. 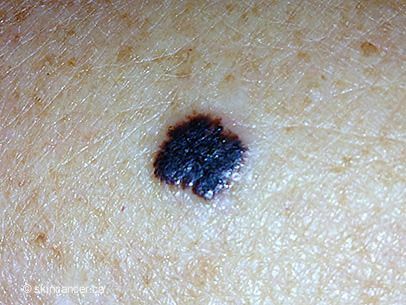 To help you identify characteristics of unusual moles that may indicate melanomas or other skin cancers, the ABCDE guidelines have been developed. Many moles which “violate” the ABCDE guidelines are biologically innocent and, unfortunately, some authentic melanomas conform to seemingly benign ABCDE features. A. Asymmetrical shape. Look for moles with irregular shapes, such as two very different-looking halves. B. Border. Look for moles with irregular, notched, “sawtoothed” or scalloped borders. C. Colour irregularity. Look for moles that have many different shades of brown or an uneven distribution of colour. D. Diameter. Most melanoma cancers are more than 6 mm in maximum diameter, although exceptions exist. E. Evolution or new Elevation. Look for changes over time, such as a mole that grows in size or that changes colour or shape. Moles may also evolve to develop new signs and symptoms, such as itch. Bleeding is a very concerning symptom and should prompt rapid medical attention. If you have a concerning mole, please contact us. Patients at risk may benefit from mole mapping. Mohs' Micrographic Surgery (MMS) is the optimal technique for most skin cancers, especially those located on the face, ears and scalp. The procedure is associated with a greater than 97% cure rate. • Dermatologist Fellow of the Royal College of Physicians and Surgeons of Canada certified 2004). Dr. Alanen has extensive post-graduate training in skin cancer surgery and is a Fellow of the American Society of Dermatologic Surgery and American Society for Mohs' Surgery. The Mohs' procedure involves the surgical excision of the visible extent of the skin cancer, along with a layer of surrounding normal skin. This tissue is then divided into sections and colour-coded by Dr. Alanen, while corresponding reference marks are made on the patient to correlate the anatomic location. The tissue is then immediately processed within the laboratory of Derm.ca and microscope glass slides for examination and analysis by Dr. Alanen. He then examines the edges of each section microscopically for evidence of remaining cancer cells. If any cancer remains, it is removed. 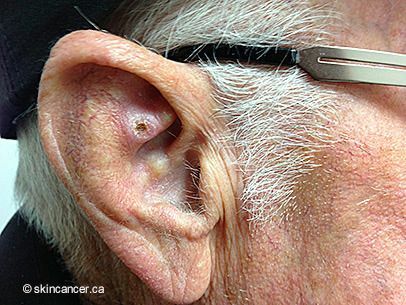 This process is repeated until no further skin cancer remains at the surgical site. 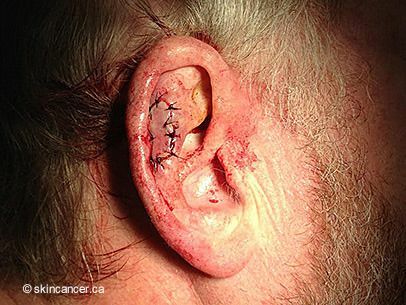 Once the cancer has been definitively removed, the area is then closed with sutures. Therefore, the appeal of the Mohs’ procedure is that all of the cancerous tissue is removed before the area is sutured closed. 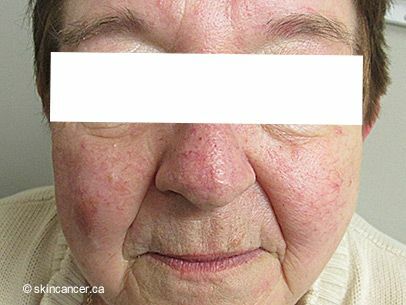 Dysplastic Nevi (atypical moles; atypical nevi) are regarded as potential precursors of malignant melanoma (the most aggressive form of skin cancer). 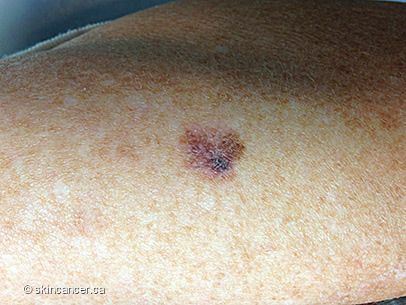 It is thought that only a small fraction of dysplastic nevi transform into melanoma The greater quantity of these lesions that a patient has, the greater should the melanoma risk; those who have 10 or more have 12 times the risk of developing melanoma as compared with the general population. 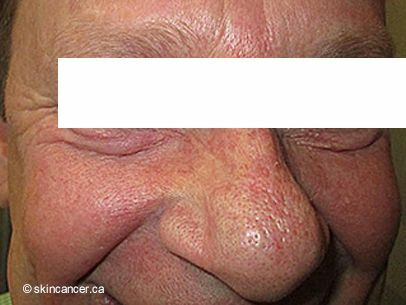 Approximately two to eight percent of the population in Canada have these moles. At times it is difficult to distinguish dysplastic nevi from early melanoma. Often, a hand held magnification device called a dermatoscope is used; this device helps to visualize subsurface aspects of the mole. When concerning features are noted, the mole is removed so that it can be examined under the microscope and the definitive diagnosis can be established. 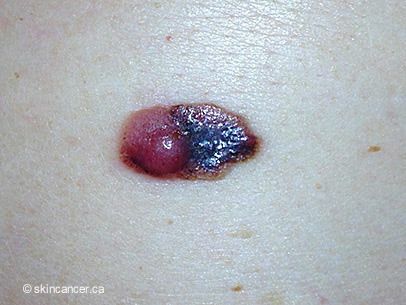 Patients with numerous dysplastic nevi are at high risk of developing malignant melanoma. Mole mapping technology allows for early melanoma detection; read more here mole mapping. If you have a concerning mole, please contact us.